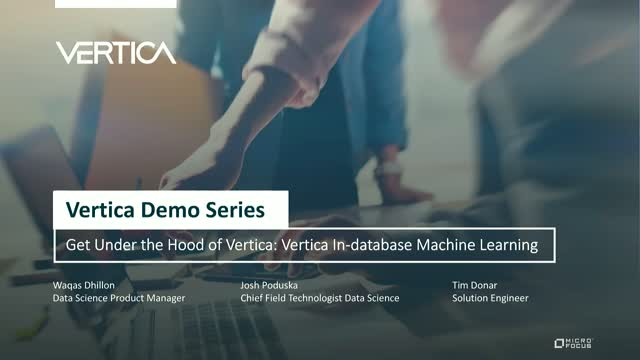 Vertica’s in-database machine learning supports the entire predictive analytics process with massively parallel processing and a familiar SQL interface. Vertica has the only native, in-database, distributed machine learning library on the market today; complete with easy-to-use features for blazing fast ingestion, complex data preparation, the fastest distributed model building available, thorough model evaluation, detailed model management, simple model deployment, and advanced integration with popular machine learning and visualization tools. During this demo you’ll get a firsthand look at Vertica machine learning using a public IoT dataset from the Irish Smart Meter project. The demonstration will cover data exploration and visualization, data preparation, model building, model scoring, model evaluation, and model management. Learn how data scientists and analysts can leverage Vertica to embrace the power of Big Data and accelerate business outcomes with no limits and no compromises.